Morzine is a gorgeous, bustling town in the Haute-Savoie region of Eastern France. The town began life as an agricultural centre for a local monastery before becoming an important centre for slate production. It wasn’t until the 1930’s that the town began to be developed for tourism and nowadays is an important hub in the Portes du Soleil domain. The pretty town centre sits at 1,000m and has lots of charming traditional wooden chalets topped with the local slate which makes for an authentic and atmospheric feel. Morzine and neighbouring Les Gets are popular destinations year round and offer the visitor a wonderful mountain experience in a delightful Alpine setting. With over 200kms of marked paths, Morzine is a paradise for the walker. The terrain offers a wide variety of difficulty so that you can enjoy a gentle family stroll or a demanding mountain hike. A manageable and popular three hour walk suitable for beginner levels is the one which joins Morzine and Les Gets. It starts when you reach the top of Le Pleney chairlift then you’ll need to walk for about an hour along the path signed for Les Chavennes before dropping down into Les Gets. For all walks at altitude which need lift access, you are best advised to purchase one of the various lift passes on offer for more details click here. 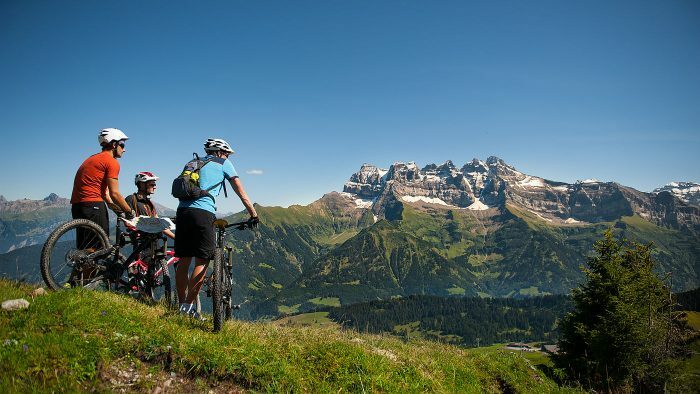 The Portes du Soleil area is known the world over for its sublime mountain biking and boasts its standing as the biggest mountain bike park in Europe. With over a 1,000kms of marked trails, great access via the extensive lift system, dedicated bike areas and to top it all scenery to die for, it’s no wonder that the popularity of the MTB scene in Morzine and Les Gets grows year on year. What mountain bikers particularly rave about is the ease with which they can reach altitude to access such vast swathes of the mountains. The lifts have adapted racks or hooks to carry bikes giving you more time in the saddle. There are also lots of MTB Guides on hand to show you the full glory of the mountain while hire of kit is readily available in the town. See the extent of the MTB terrain here. The best airport to aim for is Geneva which is only 100km away from Morzine with a transfer time of approximately an hour and a half. Chambery, Lyon and Grenoble airports are other options you might want to consider. Ready to book? Enquire about your private transfer now by completing our quick quote form. The Summer scene in Morzine is relaxed and welcoming with many restaurants opening up their sun terraces for al fresco dining, a great place to relax and kick back. The town is quieter during the day while most people are off enjoying the mountains, but in the evening there is a real buzz in the air, bustling tables spill out from the many restaurants and there’s a smell of bbq drifting on the breeze. While you are in the area make sure you try some of the local Haute-Savoie specialities. Tartiflette is always a favourite. Hearty and sustaining, this mouthwatering gratin consists of bacon, local Reblochon cheese, potatoes, onions and cream served piping hot from the oven. Locally sourced fish is often on the menu in Summer too, delicious with a glass of crisp, white wine. For mountainside eating, head for L’Exclusif which you’ll find at the top of the Col D’Encrenaz at 1,490m. Fabulous views await you along with exquisitely prepared Savoyard specialities. This place is a real find. For an upmarket dining experience, take a look at L’Atelier. There’s an appetising, sophisticated menu on offer here, the house speciality being lobster ravioli with a creamy shellfish coulis. For more Morzine dining options and reviews click here. There’s plenty to keep you entertained during the summer evenings in Morzine. Beanies café bar has weekly live music on offer while The Cavern in the centre of town stays open til late and has happy hours on offer too. Le Bowling Bar in Les Gets has a bowling alley to enjoy with a beer or two. If you are after some dancing and want to party on til the early hours, The Tibetan Café, Opera, The Dixie Bar and Coyotes are good bets. If you are after a more upscale night out, The Wine Bar at the Chaudanne restaurant has a fabulously stocked wine cellar with a sommelier to advise you and delicious tapas to accompany the drinking. Morzine works well for visitors of all sorts as it has a great range of accommodation to suit all budgets and tastes. If you want to splurge then some top end suggestions include Le Dahu, which has a lovely spa and consistently receives excellent ratings and Le Château Hotel Marmotte. The Marmotte is stunningly located right on the edge of the slopes and has fabulous pools and a spa as well as a gorgeous interior and highly recommended restaurant. If you prefer to self-cater then the chalet and apartment offering in Morzine is pretty extensive. Some of the boutique agencies such as Morzine Ski Chalets and Morzine Lets have a good selection of properties. For budget travellers have a look at the charming Hotel L’Igloo or the very friendly Hotel Sporting. One thing is for sure: you simply cannot get bored in Morzine! The range of activities on offer is really second to none, it’s really no surprise that this gorgeous mountain area is a mecca for adventurous holidaymakers. If you want a change from walking or cycling the mountains can be enjoyed from the air, as the paragliding scene is really buzzing here. Why not give it a go and book a tandem introductory flight? For Golfers there’s a 9-hole course in Morzine while the 18-holer in Les Gets is a great technical course. If you like to enjoy the water on your holiday, then the options are limitless. There’s canyoning available locally and also on Lac Montriond you can hire pedalos, canoes or have a go at stand-up paddle boarding. There are plenty of lovely lakes to swim in too and the Parc des Dereches has some lovely indoor and outdoor pools for you to enjoy. For a full directory of entertainment in Morzine and Les Gets, this is a really useful and comprehensive guide. No doubt the biggest draw for Summer visitors to Morzine, is the beautiful mountain scenery and jaw dropping views. This is a true natural paradise for all to enjoy and no visit would be complete without fully enjoying the refreshing mountain meadows with their beautiful flowers and of course spending time admiring the imposing Mont Blanc; just remember to bring your camera. Another natural phenomenon not to miss is the The Pont du Diable gorges. Open throughout the Summer months, these impressive caves are located by the picturesque River Dranse. Well worth a visit is the impressive Abbaye d’Aulps in the centre of St Jean d’Aulps in addition to the medieval fishing village of Yvoire. Morzine is very proud to be one of the locations to be chosen for a stage of the Tour de France. To help with the celebrations, the town has launched operation ‘Les Pois Rouges’ whereby roads and buildings are being painted red and everyone is being encouraged to hang flags and even dress in red to make the town stand out when the Tour comes to town. For those who prefer their cycling off road, lookout for the Morzine Whip Off event which takes place on the 20th July. Mountain bikers are promised a fantastic event and prizes and a festival feel is on the cards. August gets started in Les Gets with a very relaxed vibe as the town plays host to the annual Lounge Music Festival. 35 free concerts are being laid on for all to enjoy across a week of live music. Musical workshops for youngsters are also on the programme and the festival draws to a close with a live performance from the ever popular Florent Pagny. The Summer season roars to a close in early September with the annual Mont Blanc Rally. For the past 20 years this annual event has drawn crowds of motor sport enthusiasts who come to admire the fine collection of rally cars who enter the race and to watch them speed around the back roads of Morzine and Les Gets before they leave town in a flurry of dust, bound for the Cote d’Arbroz. For animal lovers be sure to visit Les Lindarets or ‘the goat village’. Kids will love stroking the 40 or more goats who wander around the streets of this picturesque mountain village, just make sure you keep your picnic out of reach! Another lovely animal activity is to go on a gentle stroll through the mountain pastures on a donkey trek. Children will be able to lead and pet the donkeys along the way.